Intermediate/Advanced. After much debate, it seemed only fitting that Volume 100 should celebrate the music of the great innovators who started it all. Recorded in an authentic style, this Play-A-Long promises to be entertaining as well as educational. RHYTHM SECTION IS: Steve Allee, Piano; John Goldsby, Bass; Rob Rawsthorne, Drums. December 14, 2013 Backing tracks are excellent! the example tracks. But those notes presume knowledge of music theory, and may not be enough for a rank beginner to use. Worth it for the backing tracks alone, if you already play jazz violin! As an intermediate jazz student these are quick, but doable. They will really crank up your Dixieland chops. Practice with a metronome until you are close to their speed, then you can have a blast playing along with the CD. 27 of 61 people found this review helpful. A good selection of Traditional favourite, easy to read and well orgised.Encouraging for begginers. A favourite in my library. 34 of 79 people found this review helpful. 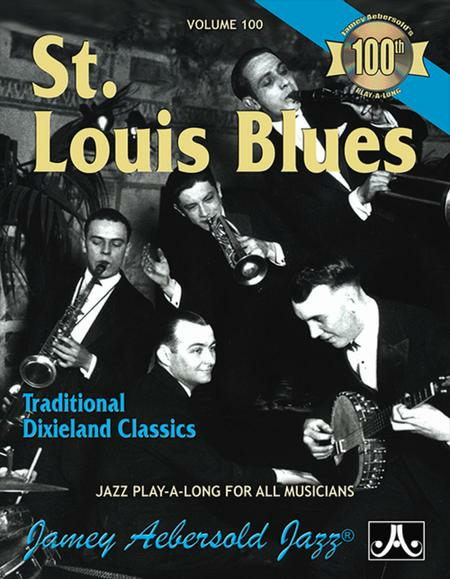 March 25, 2012 Vol 100 - St Louis Blues. The sound and the choice of songs was great. Problems: Music was extra fast and difficult to keep up with in play-along. Could not slow down on a Bose player! Also the group would prefer thst sll instruments should not have the melody! 37 of 90 people found this review helpful. Far too many repeats in it and in case you are not able to improvise, the book is of little use. For me it doesn't have any use whatsoever. I didn't know it was written by Jamie Abersold, otherwise I wouldn't even have contemplated buying it. 47 of 107 people found this review helpful.